Looking for that custom key chain? 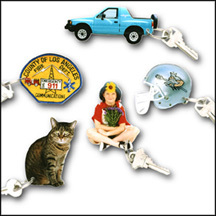 Create your very own FotoArt key chain. Send us one of your favorite photos and we’ll turn it into a unique, personalized 2" x 3" key chain just for you. 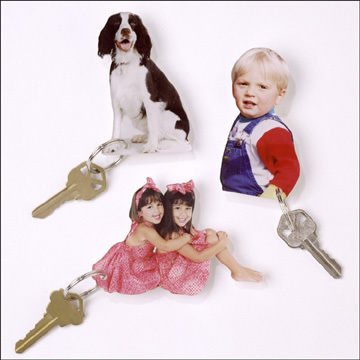 Want to make a key chain from your baby’s handprint or footprint? It’s simple, click here. Keychain comes complete with a metal key ring. Absolutely loved the key ring. Gave it to my son-in-law for Xmas. It is a real action figure of my grandson and Foto Art really depicted the action. Great work! Thanks. We regularly order all our fun products from fotoart and their quality is first class. My clients order them year after year! I have ordered keychains every year for Christmas gifts and have always been extremely pleased!!! This year was as perfect as ever! I would highly recommend this product to everyone. I have actually had many people ask me where I had the keychains made and I've referred them to this website!